Two teenagers have died and two more are fighting for their lives after a crash in Morley. 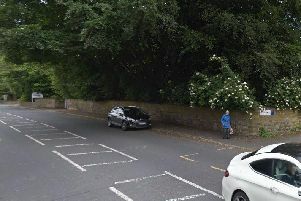 The two boys from the Morley area, aged 13 and 14, died after the car they were travelling in crashed on the A62 Gelderd Road, close to the CAT Finning shop, at 1.50pm yesterday (Saturday). They have been named locally as George Wharton and Rhys Baker. Two other 14-year-old boys, who were also in the car, are in hospital in a critical condition. The driver of the car, a 21-year-old man, is in a serious but stable condition. “This is a terrible tragedy for two young boys who had their whole lives ahead of them,” she said. Police said the car was travelling along the A62 in the direction of Gildersome when it left the road and collided with a tree. No other vehicles are believed to have been involved, although it is thought the car over took another vehicle at speed during the incident. Supt Millar, of Leeds Police, said: “It would appear that the vehicle lost control, and has ended up hitting a tree. “One of the passengers, a 13-year-old boy, died instantly at the scene, and a second boy died later on in hospital because of his injuries. “Two other boys remain critically ill, and the driver is also seriously ill but stable. Specially trained officers are currently investigating the exact circumstances of the incident and helping the families. Police are also with the driver, who is currently in a stable condition. The two boys who died attended Bruntcliffe School and the Morley Academy. Officers are working closely with the schools to support staff and pupils. “Tomorrow will be a very difficult day for everybody so we are working with the schools to make sure we are supporting them as much as possible,” Supt Millar said. “Specially trained officers are with the families at the moment, at the hospital, and we also have our local neighbourhood teams out in the community. “We will be talking to the heads today and our absolute aim is to provide whatever support will be needed for the schools tomorrow. Police believe the man picked the four boys up from their homes, without the permission of their parents, before driving around the local area. Officers want anyone who may have seen the blue Peugeot before the crash to get in touch. Supt Millar added: “This blue Peugeot was out and about in the Morley area yesterday, particularly in the area of Rein Road in Morley and the Tesco Express on Churwell Hill. I would ask anybody who saw this vehicle to please make contact with police, phone 101 and let us know what you saw. Tributes to George and Rhys has been posted on social media sites. Leave you own messages of condolence here.